Baton Rouge, LA – As part of Louisiana’s commitment to highway safety and traffic management, Louisiana State Police Troop locations across the state will begin using the Louisiana Department of Transportation and Development’s Traveler Information System as the primary traffic incident and roadway closure alert method for motorists. LSP’s current Nixle alert system will remain operational; however, Troop personnel will primarily utilize the DOTD Traveler Information System for daily notifications on traffic crashes, congestion, roadway construction, and hazardous incidents affecting both citizens and travelers through our state. 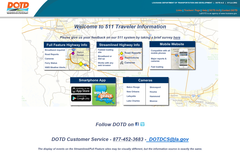 Louisiana’s Traveler Information System can be quickly and conveniently accessed through several different methods including the 511 phone system, www.511la.org, LA DOTD Twitter accounts, and the “Way to Geaux” smartphone application. Depending on the method utilized, the traveler information system allows access to valuable resources such as current road reports on crashes and construction, real time traffic camera views, and ferry status updates. Twitter users can also receive traffic alerts by following their preferred region’s Twitter account. Alerts can be sent as text messages to mobile devices by configuring the setting for each region or account to “Turn on mobile notifications.” Users can also visit the Twitter pages to check traffic alerts without having to sign up for a Twitter account. Additionally, motorists can utilize the DOTD "Way to Geaux" application to receive real-time, around the clock travel alerts. The hands-free, eyes-free smartphone application can be downloaded on any iPhone or Android device by visiting either the iTunes App Store or Google Play. As lane closure and congestion information is input into the system, the alerts are read out loud to the user while traveling in the area where an issue is occurring. In conjunction with the DOTD Traveler Information System, citizens can stay abreast of major roadway closures, emergency incidents, and pertinent safety information through LSP’s social media accounts at www.facebook.com/LouisianaStatePolice and https://twitter.com/LAStatePolice. Motorists that witness hazardous road conditions and/or reckless drivers are urged to call *LSP (*577) and report that activity to the nearest Louisiana State Police Troop headquarters.